I call Bob McKeage at International Yacht Collection to congratulate him on his recent sale of Westship's 29.99m Citation II_ and he cheerfuly tells me that she's only one of two boats he's closed on over the past few days. He promises that we'll be the first to know about his second sale, so do watch this space. 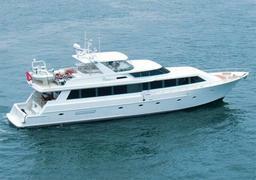 _Citation II was built in 1992, accommodates six guests in a master, double and twin and was asking $1.95 million.